With the spike in numbers of refugees and other immigrants arriving in Europe in the past two years, many Schengen countries have rushed to control the flow of people by using these special temporary exemptions. When we published our previous map of border controls within Schengen this past February, there were seven member countries reserving the right to perform border checks. Now there's one fewer, and the remaining six have renewed their declarations - perhaps for the last time. It's important to note that the border controls shown on the map above are the maximum allowed under each country's declaration - actual enforcement may be extensive, limited, or even absent depending on the circumstances. 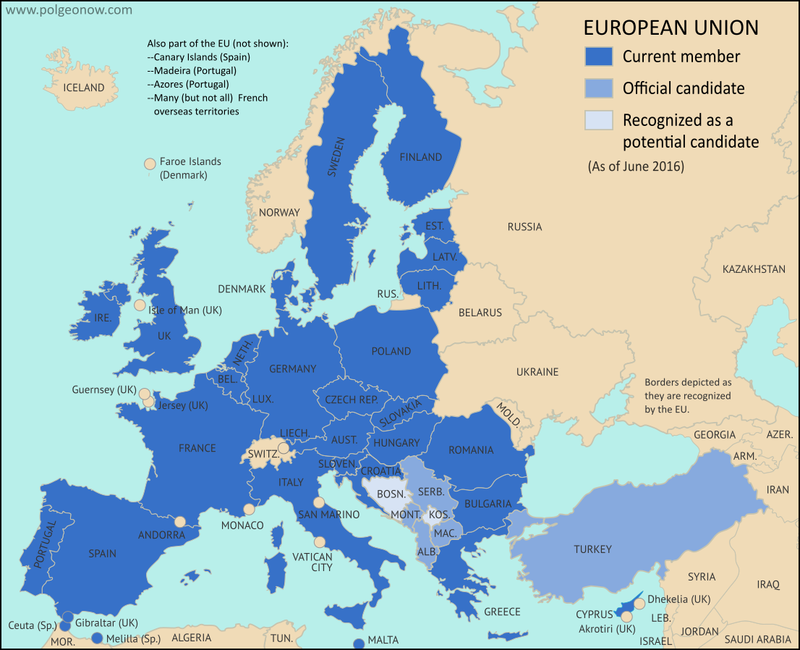 Learn More: The UK already isn't part of the Schengen Area or Eurozone, so what will change when it leaves the EU? These border controls were extended three more months in November 2016, then another three months in February 2017. Finally, on May 11, the EU government approved one more extension - this time for six months. But this will be the final extension allowed under official Schengen rules: According to the plan, the five affected countries will have to phase out all Schengen-internal border controls by the deadline of November 11, 2017. In fact, Sweden had already announced just before the extension that it would be ending some border checks for travelers arriving from Denmark; but the announcement said other types of checks would continue, and the country did go ahead and notify the EU that it would accept the extension to November. Unlike most of the countries with temporary border checks, which have focused their controls on specific stretches of borders popular with refugees and other migrants, France has reserved the right to maintain controls on all its borders - except, presumably, the boundary with tiny Monaco, which for immigration control purposes is already treated like part of France. Jan. 27, 2017 5 months, 18 days "persistent terrorist threat"
July 16, 2017 3 months, 15 days "persistent terrorist threat"
The most recent extension, posted on the EU's Schengen website but apparently not reported in the English-language media, expires after October 31. This is probably part of newly elected President Emmanuel Macron's plans to extend the country's overall state of emergency, though Macron does say he believes in preserving Schengen's free-travel principles in the long run. That attitude stands in contrast to his defeated opponent for the presidency, Marine Le Pen, who had promised to suspend all participation in Schengen while also preparing for a vote on leaving the EU. At the time of our last Schengen border control map report, the tiny island country of Malta had also declared temporary border checks as a security precaution while the country was hosting two important political summits related to migration into Europe. Those checks lasted for just twenty days, expiring after February 9. Since then, Portugal also announced temporary border controls, for security during a visit by the Pope (May 10-14), and Italy did the same when hosting a G7 summit (May 10-30). Germany also reserved the right to enforce controls on all its borders - not just with Austria - from May 15 to July 9 while it prepared to host the G20 financial summit. 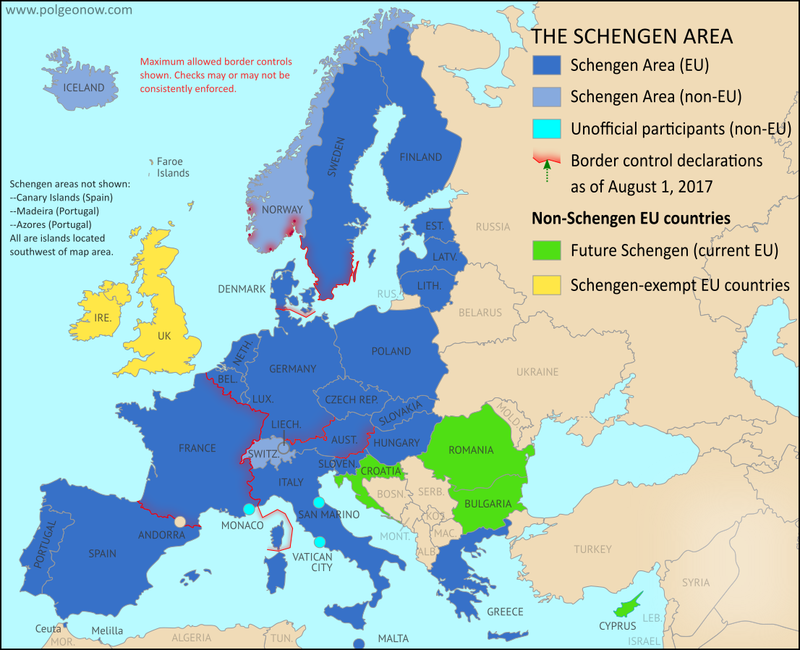 These truly temporary suspensions of free travel are a normal part of the Schengen system, and all three countries have since let the declared controls expire.